Let’s move on to what’s happening for Hoosier Geeks! February 13th: Ron Braun Signing at Comic Carnival! Local creator Ron Braun (Once Upon a Platypus) will be at Comic Carnival in Indianapolis from 11:00 AM to 6:00 PM signing, selling, and talking about his books! Ron’s a cool dude, so I recommend going to take a look! February 16th: Keep Gaming Indy @ Moonshot Games! The fantastic local folks at Keep Gaming Indy are having their next meet up at Moonshot Games in Noblesville! It’s from 10:00 AM to 6:00 PM, and they’ll have giveaways, too! Take a look at their site for info on what’s going on! February 20th: Little Guardians Signing at Downtown Comics North! Ed and Lee from Little Guardians will be at Downtown Comics North, near Castleton Square Mall in Indianapolis, from 5:00 PM to 7:00 PM signing copies of their books for folks like you! You ARE going to be there, right? February 23rd: Boiler Con! Back for the 5th year, this free show in the Union Ballrooms runs from 11:00 AM to 7:00 PM. It features vendors, artists, a costume contest, guests, VR, an escape room, and more! Take a look at the event listing, if you’re in the area! March 9th: Geek Mania 2019! Held at the Central Middle School in Columbus, this event is a senior project done to promote youth literacy. Running from 12:00 PM to 3:00 PM, they’re going to have vendors and costumers available. Take a look at the Facebook event page if you’re in the area! 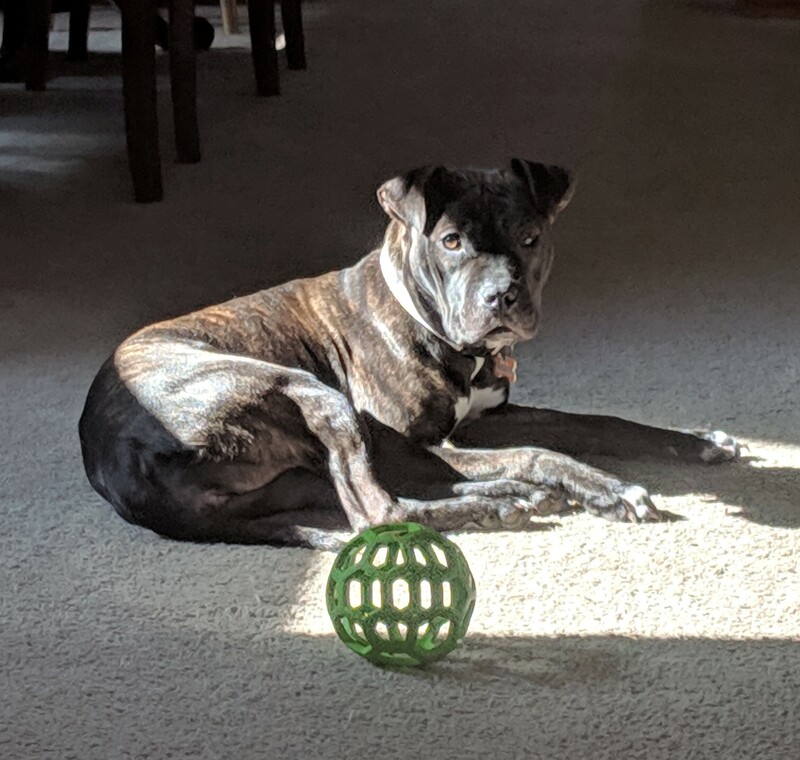 Today’s Picture: The Geek Pup, who’s almost as big as the Geek Dog at this point, enjoying a sun beam and wondering why I’m trying to get her attention. Twitch – You know what? I’m really good at taking a joke too far. Starting this week, I’m going to start Twitch Streaming when I edit podcast audio for You’re Gonna Love This… or Not, The Social Sci-Fi Podcast, and the Indiana Geeking Podcast. Will this be possibly the most boring stream ever? Probably, but dang it, why not? Feel free to subscribe, and watch Twitter for when I’m streaming. It’ll probably be a weeknight, after 8 PM Eastern.